The Chief Minister Andrew Barr and Capital Metro Minister Simon Corbell today announced that the consortium Canberra Metro had been awarded the contract to construct and operate Capital Metro Stage One. Thus historic announcement came after several months of negotiations with the two shortlisted consortia. The two consortia bidding for the contract were Canberra Metro and Activate. Both consortia had multinational expertise in construction and operation of light rail networks, and building light rail vehicles. Canberra Metro is comprised of Pacific Partnerships, CPB Contractors, John Holland, Mitsubishi Corporation, Aberdeen Infrastructure Investments, Deutsche Bahn International and CAF. Activate is comprised of Downer EDI, Bombardier and Keolis Downer. It operates the new Gold Coast light rail and Melbourne's tram network. The contract will deliver 12km of light rail track, 13 stops, 14 light rail vehicles, a depot and 20 years of operation and maintenance. Submissions for the $783 million contract closed last September with the development application for the first stage approved last month. "While the final cost will be confirmed when contracts are signed, the capital cost included in the winning bid is $698 million, with a variance of 5 per cent depending on contract negotiations and changes in market conditions between now and contract closure". "Additionally, Canberra Metro will complete construction in late 2018 and begin operations in early 2019. This is sooner than previous estimates and means less disruption for Canberrans and faster access to the transformational effects of this city changing project,"
"The staged approach will mean that as sections of trees are removed, and replaced with 4m tall plantings, there will only be periods of 3-4 months where each section will be without trees,"
The disrespect Andrew Barr and ACT Labor have for Canberrans is disgraceful as the government commits to a light rail tenderer without a mandate, Shadow Minister for Transport Alistair Coe said today. “Andrew Barr is squandering taxpayers’ money without giving them an opportunity to have a say on how it should be spent,” Mr Coe said. “Light rail is deeply unpopular in Canberra, but again today we see Andrew Barr is more interested in his own grandeur than providing responsible government for the ACT. “Serious questions remain about the rate of finance, repayment information, the scope of the works and the government’s contribution to construction. 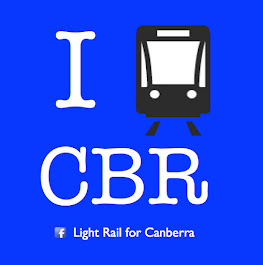 ACT Light Rail Media release to local news outlets. ACT Light Rail Chair Damien Haas is pleased at the announcement of a successful bidder to construct Capital Metro Stage One. This announcement comes after several months of talks between the Government and the two shortlisted bidders. "The competitive bid and the sooner than expected completion date, are compelling reasons to award the tender to this consortium. The sooner we can use light rail, the better". On the subject of paying for Capital Metro Stage One, Mr Haas said "The $370 million raised from asset sales and the contribution of $60 million from the Federal Government for light rail means that we have over half of the total cost already covered before the first payment is due in 2019". will give Mr Hanson and Mr Coe that opportunity. Their own federal colleagues describe that as 'economic lunacy'." "I suggest that anyone who thinks that ripping up contracts is a winning policy, go to the Gold Coast and ask them if they want to shut down their light rail service." Mr Haas said that ACT Light Rail looks forward to construction beginning in several months. The Canberra Times reported on the announcement here. ABC Online reported on the announcement here. The media release from Andrew Barr and Simon Corbell can be found here. The media release from greens MLA Shane Rattenbury can be found here.